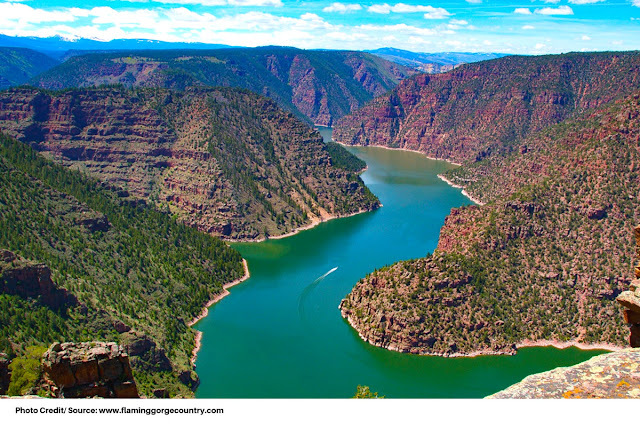 With over 207,363 acres of scenic landscape, deep glass waters flowing through the rugged landscapes, and one huge spectacular reservoir, it is no surprise why Flaming Gorge is considered a must-visit destination for anyone seeking an adventurous escapade while in Utah. It is a destination encompassing thrilling limitless outdoor activities, thus a perfect spot to spend time with your loved ones all year round. 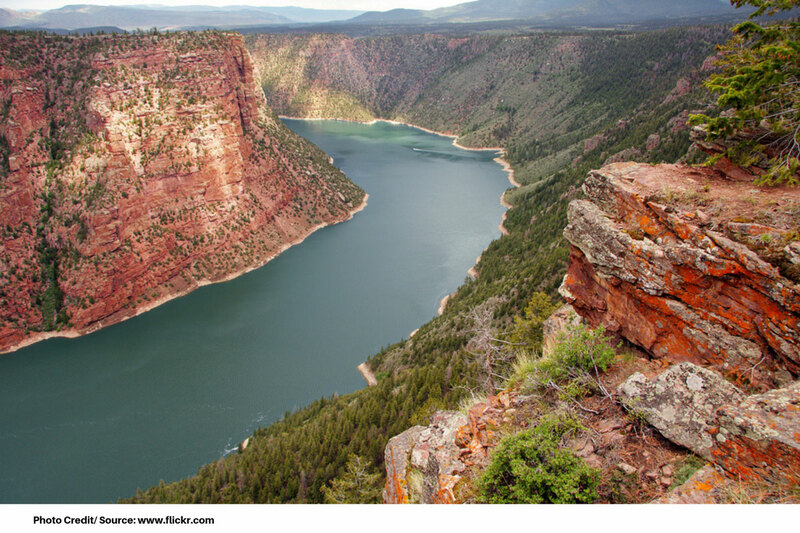 The over 200,000 acres of land and water combined make Flaming Gorge a perfect scenic playground for camping, backpacking, boating, waterskiing, windsurfing, and not forgetting some of the best fishing in the west. The ‘Flaming Gorge’ name was actually inspired by John Wesley Powell’s Green River expedition in 1869. As the story goes, Powell and nine other men boarded small wooden boats at the Green River with the aim of exploring the Green and Colorado Rivers. They slowly worked their way downstream and successfully completed their journey in late summer. Powell named it Flaming Gorge after he and his men saw the captivating view of the sun reflecting off the red rocks. To date, visitors are still captivated by the revitalizing aura of rays of sunlight being radiantly reflected off in red and orange hues layering within the canyon walls, making them look as if they are on fire. 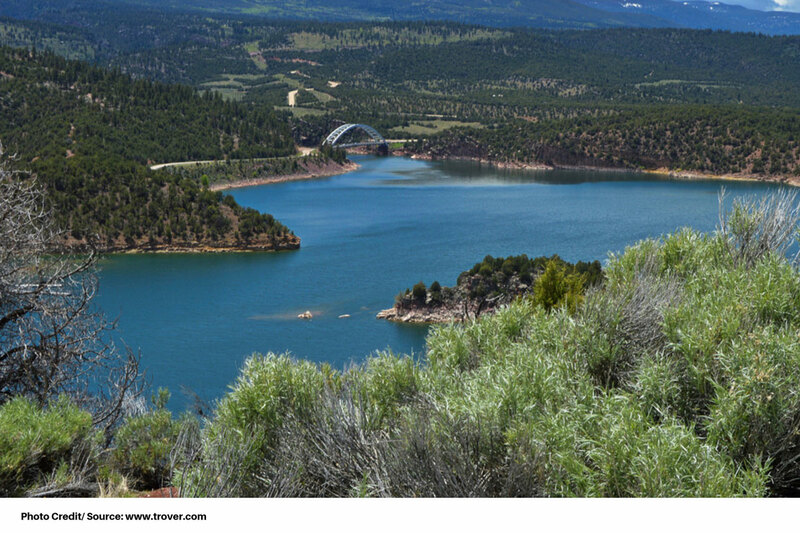 Measuring around 91 miles, Flaming Gorge Reservoir has been confirmed to be the area’s most popular destination in Flaming Gorge. The waters of the reservoir are cool, even in extremely hot summers. It is, therefore, a loved destination for visitors seeking limitless adventure in boating, skiing, surfing, and house boating among other water sports. Together with the Green River, the reservoir has made Flaming Gorge quite popular because of its record-breaking fishing. It is most famous for the good number of 30+ pound fish caught annually. The most recent record-setting trout went 51 lb 8 oz, but it is likely that there are yet bigger ones swimming out there waiting to be caught … who knows, you might snag the next record-breaker. 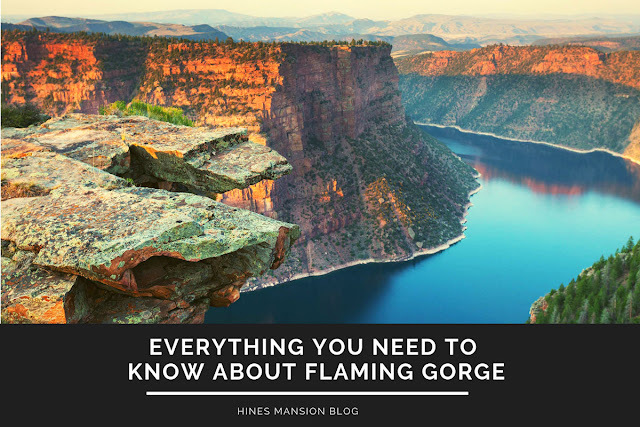 Don’t get me wrong: fishing in Flaming Gorge is by no chance monotonous as there’s a variety of other fish types, such as rainbows, kokanee salmon, burbot, smallmouth bass – just to mention a few. Furthermore, the reservoir rises 502 feet above bedrock, has a surface area of 42,020 acres, and has a total capacity exceeding 3,788,900 acre-feet – making it the largest reservoir in Wyoming. You can, therefore, be guaranteed of plenty of much space, regardless of the traffic. Since it feeds the Flaming Gorge Reservoir, it is not hard to explain why it is an equal attraction point when it comes to fishing activities. The Green River is considered among the best trail water fisheries in North America and is home to some of the best Rainbows, Browns, Cutthroats, and Cut-Bow Hybrid trout. According to the Division of Wildlife Resources, the Green River has fish count reaching up to 22,000 per mile - between the dam and Red Creek rapids. If it’s your first time in Flaming Gorge and you are seeking to explore the Green River, the Flaming Gorge Resort is known to offer guide services – with an option of supplemented transportation to and from the Green River and a hearty meal. The guides will come to your aid if you don’t have your own boat but you can still easily rent one from the various rental shops available in the area. You can choose between fly-fishing, spin-fishing, or a combo of both – it all depends on what you aim to achieve at the end of it all. Fly-fishing is no doubt fun in a river like this, but if you are looking forward to catching some of the biggest fish, I would recommend spin fishing as it makes it easier to get to the bottom waters where they are available in plenty. If fishing is not your ‘thing’, you can still to explore other fun activities available on the Green River such as kayaking, canoeing, or even paddle-boarding. You can choose to row between the 1000-foot-deep canyons, or through the wide areas and get to enjoy the beautiful scenery. Either way, the experience will be one memorable one. Activities in Flaming Gorge are by no chance limited to the reservoir and Green River, there are plenty of fun activities you can enjoy when not in the water. Regardless of the season, there’s always plenty of fun waiting for you to explore. In the summer or spring, you can choose to explore the mountains and the surrounding scenery by hiking, mountain biking, or even scenic drives. One of the most popular trails is the Bear Creek Trail which starts right from Flaming Gorge Resort and goes for about 2 miles giving you a magnificent overlook of the reservoir. However, you are not limited to this trail and you have an option to pick amongst 10 other trails. Come winter, there’s a different type of fun but still great altogether. Fishing is all year round, but you can still choose among other numerous winter activities such as snowmobiling, cross-country skiing, and the Burbot Bash. In spring, the activities are quite similar to those in summer – all but with a difference of traffic. If you hate congestion, this would be a great time for you since spring is considered off-season. In spring, adventures are still unlimited but typically at a lower cost. This is usually because you will not have as much difficulty finding accommodations since the demand is quite low during this season. Biking the trails in summer is limited, so spring is a great time to take advantage and enjoy the amazing scenery and wildlife without many limitations. By heading out to Flaming Gorge, you can be guaranteed of unlimited fun with your loved ones. However, if it is your first time there, I would advise hiring a guide so as to get the best of experience. Also, in order to access Flaming Gorge, you will be required to have a ‘pass’ – which can be easily obtained from the visitor centers.